Re: St Winnow - Sophia Adams - who were her parents? Thanks for that information - that explains why I can't check my possible ancestors' details from St Winnow details on the OPC site. I'm checking if the details you gave me are my direct ancestors' details - which is all part of my process of elimination. There seems to be a THOMAS ADAMS who married CATHERINE PEARCE, in 1741, and a THOMAS ADAMS (son of Thomas and Catherine, maybe?) who married MARY CHELEY at St Winnow in 1763. THOMAS and MARY also had a daughter REBEKAH (although spelling is probably irrelevant) baptised 1 January, 1771, and I'm trying to establish if she is the REBECCA ADAMS mother of GRACE ADAMS, born Trewen, 1792 - there being no father mentioned at the baptism, although one identified through banns but no subsequent marriage for our REBECCA. I'm also researching a REBECCA from an ADAMS family from St Mellion, but am particularly interested in the St Winnows connection as I am trying to find a connection to a DNA match who has a CATHERINE ADAMS born St Winnow in 1800 in their ancestry. I have most of my St Winnow details from LDS Family Search. From LDS, I found a family tree for REBECCA LITTLETON, born ADAMS. This indicates she was born at Luxulyan 5th April, 1779. There is also a burial of REBECCA ADAMS in the Luxulyan records for 17 October 1779, with no further identifying details. I had assumed the death was of the baby REBECCA born in April - until I found her marriage to LITTLETON. I'm sure they must all be connected, one way or another. Thanks again. Thomas Adams, yeoman, of Lanlivery & Catherine Cundy of St Winnow 9 March 1795. From FreeReg, Rebecca Adams married William Littleton by licence 12 Dec 1800 in Lanlivery. She was baptised 1 Jan 1771 in St Winnow dau of Thomas, no mother mentioned not unusual at this time. I haven't spotted her burial as yet, daughter Rebecca Adams Littleton bp 12 Nov 1806 in Lanlivery. Charity Adams married James Stephens 15 June 1785 in St Winnow, she was baptised in St Winnow 6 March 1764 dau of Thomas & Mary. Thomas Adams married Mary Cheley 13 Nov 1763 in St Winnow and was baptised 31 May 1742 son of Thomas & Catherine. I wouldn't worry about spelling of names at this time. The spelling is down to the cleric recording it and it can vary. 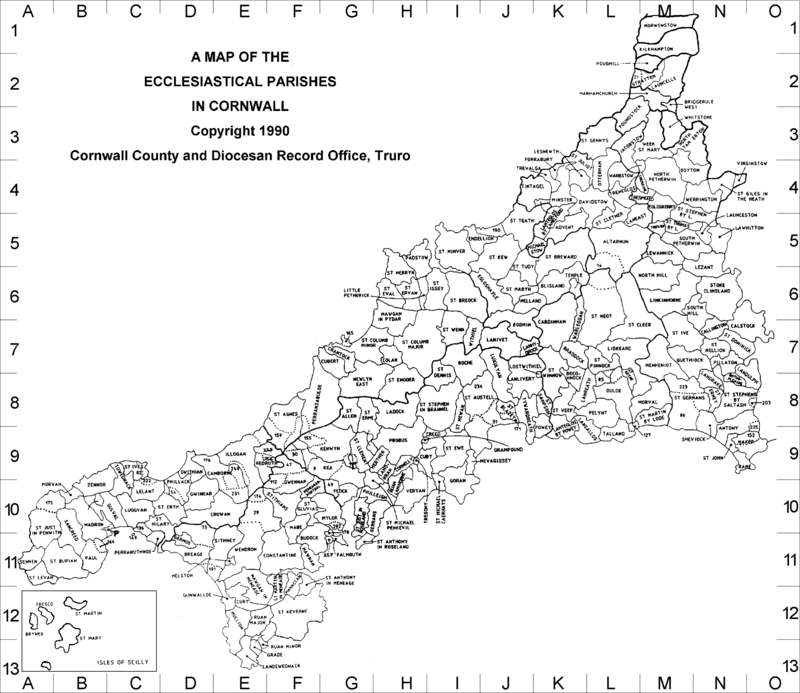 There's no one site that has all the records, so try using OPC, FreeReg, Family Search and Findmypast has transcripts of some of the Cornwall Family History Society records. How have you identified her father from banns? All that is recorded in banns is their parish, marital status, and the dates of the 3 readings. Do you mean the parish record of the marriage? Oh Wow, Thank you so much for all your research and help. It's very much appreciated. According to my amateur detective work, Rebecca Adams of Trewen was the mother of Grace Petherick - as per parish baptism register, 15 August,1892. Petherick may have been given as baby Grace's surname as a nod to impending legitimacy, or a middle name as an acknowledgement of the father. I believe this is most likely the Grace Adams who married James Harris at St Juliot, 15 July, 1818. Interestingly, there is a record (photo image, Family Search) of the banns being called between Rebecca Adams of Trewen and William Petherick of Treneglos, in the month before Grace's birth . . . but there is no evidence of an eventual marriage. Further, I have found a photo image record (Family Search) of the banns being called between (most likely our) Rebecca and Robert Hancock of Trewen in 1799/1800 (no date given) - but at least 9 months before the birth - and death - of baby Anne in October, 1800 - who was baptised as Ann Adams. No mention of the father again in the baptism records, and no evidence of a subsequent marriage between Rebecca and Robert. I found an image (Family Search) of a marriage licence between Peter Darton and a Rebecca Adams (1805) of the St Stephens by Saltash parish - and no evidence of the actual marriage again, so if that's our Rebecca, she does seem to be a recidivist fiancee . . . Interesting to speculate the story behind those details. The family of Thomas Adams and Mary Cheley from St Winnows (Family Search) have a Rebecca who fits the necessary criteria - I'm just not able to find out what happened to her post-baptism. I'm wondering if she's the sister of Charity Adams, and Joseph Adams (father of the Sophie Adams in the title of this post). There's another Adams family from St Mellion - with a Rebecca and two other daughters who had illegitimate children - so there's another possibility. It's very easy to mix up the members of the different families - with so many similar names, places and dates! Many thanks again. You have been a great help. I shall continue to tease this out. I'd already mentioned that Rebecca, daughter of Thomas & Mary, married William Littleton 12 Dec 1800 in Lanlivery. Thomas makes bequests to her children, Thomas, William, Mary & Rebecca, referring to them as the children of his late daughter Rebecca deceased, so she died before he wrote his will, 22 Feb 1825. Parish marriage entry for your Grace, no mention of father's name as is the norm at that time. One of the witnesses, Joseph Heals, signs on a few marriages on the page so may have been the parish clerk. The marriage did take place, otherwise the church would not have known about the licence.